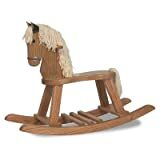 The FireSkape Heirloom Rocking Horses are hand made from strong oak by experienced Amish craftsmen in our Northern Indiana factory. The Heirloom Assortment functions substantial high quality furnishings finishes hand utilized for sturdy and lengthy lasting services. This is a toy that is just as considerably to play on as to look excellent in your property and produced to the exacting requirements and top quality of the originals. Our items are predrilled and counter-sunk screw assembled with wood glued joints to provide the most tough and sturdy item possible. Hardwood dowels cover the screw heads so no unattractive exposed screws are noticed. The horse manes are produced from hand spun 100% polyester yarn and permanently mounted to the horse head. The Rockers are shipped entirely assembled and ready to take out of the box and perform. FireSkape Heirloom items will quickly turn out to be a household tradition to pass down to potential generations.